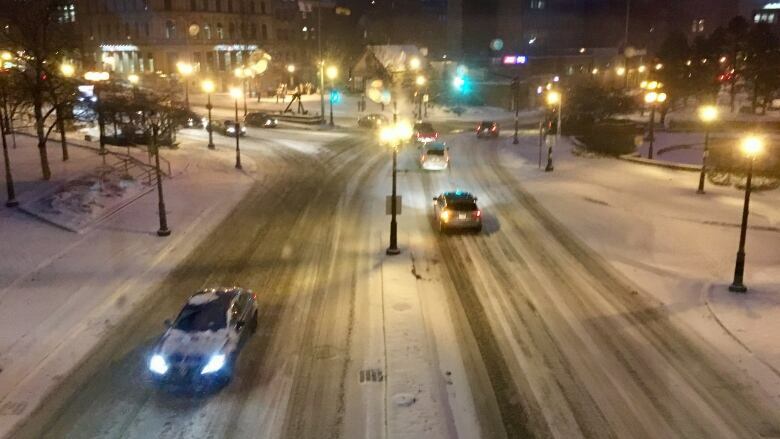 Another messy storm is underway in New Brunswick, with parts of the province seeing snow, others freezing rain and some an unlucky mixture of the two. Another messy storm has been in full force in New Brunswick, with parts of the province seeing snow, others freezing rain and some an unlucky mixture of the two. Almost all of the province fell under an Environment Canada weather warning starting Wednesday evening. Motorists are being cautioned against potentially hazardous driving conditions. "A low pressure system will approach the Maritimes from the southwest this evening," the warning statement said. "Snow over western new Brunswick will spread eastward this evening. "Rapidly accumulating snow will make travel difficult. If visibility is reduced while driving, slow down, watch for taillights ahead and be prepared to stop." Snowfall amounts of 15 to 25 centimetres are expected in the central parts of the province, according to the federal agency. That figure could be as high as 30 cm for some eastern communities. The chance of snow continues into Thursday morning. In the southern areas, along the Fundy coast, snow is expected to shift to ice pellets, then freezing rain and rain before the storm clears. As of 6:30 p.m., the province was reporting several main highways across the entire province were either snow-covered or partly covered, including Route 7 between Fredericton and Saint John, Route 1 between Moncton and the border with Maine and sections of Route 2 between Fredericton and the Quebec border. Highways near Miramichi and west of Campbellton were also partly covered. Updated road conditions can be found here.